A law passed a few weeks ago in the Caribbean might have gone largely unnoticed, but it sparked hope in the heart of one Montreal-area skater. Maxime-Billy Fortin, 26, was born in Haiti but was adopted into a Quebec City family and quickly became an avid figure skater. 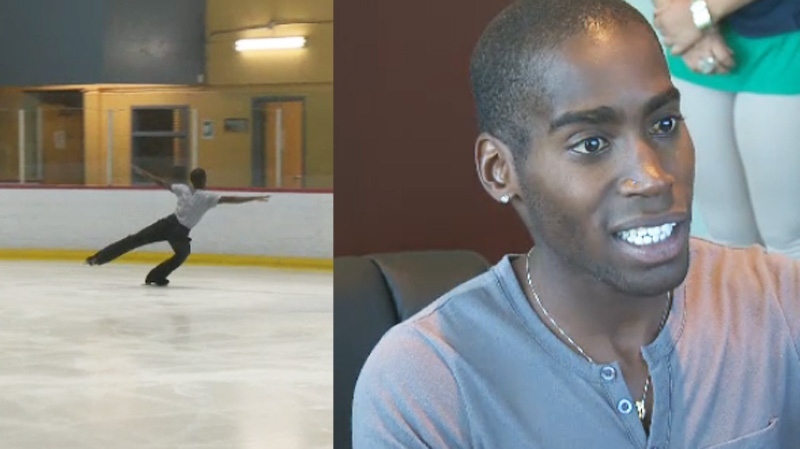 He has dreamed of skating internationally for Haiti but because he is Canadian, he was not eligible to hold a Haitian passport. However in mid-June Haitian President Michel Martelly came through on a promise to allow for dual citizenship, meaning that Fortin can now skate for the country in which he was born. Fortin said that he dreams of sharing his joy for the sport on the international stage, as his skating communicates his pleasure of being on ice. “It's always positive, it's always a crowd pleaser, I want to make the people dance I want to make the people happy,” said Maxime-Billy Fortin, who has represented both Quebec and Canada internationally. Fortin gave up figure skating but embarked on a comeback in 2010. His coach said that he’s back where he belongs. “I could tell that he still had the fire and the love of the sport,” said coach Bruno Marcotte. Fortin seeks not only to showcase the sport to his hilly homeland, he also hopes to reconnect with the nation on a personal level. “I never went to Haiti and I think it’s important for me to relate to my origins and maybe one day try to find my mom and try to find my dad,” he said. Fortin dreams of becoming the first-ever Haitian winter Olympian and Haiti’s Montreal-based Consul General agrees that it would be nice to see the country in the winter games. “Haiti's youth needs to find hope and through his sport Fortin can show them that they are capable of anything,” said Consul-General Justin Viard. The right to Haitian citizenship was an election promise made by Haitian President Michel Martelly, who is closely associated with musician Wyclef Jean, whose quest for the presidency was shot down by his lack of Haitian passport. Many people born in Haiti now living abroad pushed for dual citizenship, as they sought a greater say in the goings-on of their homeland. Haiti, a country of 9.8 million, receives an estimated $2 billion in remittances annually from the two million-strong Haitian diaspora, an amount representing about 20 percent of the annual GDP. Haitians are now allowed dual citizenship, a fact that has Maxime-Billy Fortin dreaming of becoming the country's first winter Olympian.